In true bending, the rider flexes the horse's body into alignment with the bend, so that the action of the hindlegs follows the direction of the horse's body, allowing the energy that each hindleg generates to be transmitted forwards towards each corresponding foreleg. The rider achieves this alignment of the horse's body principally by the postural influence of the inside of their body, which stretches and sends weight down into the inside seatbone and stirrup. This creates a 'pillar' around which the bend of the horse's body can be formed, with the help of the outside leg stretched back to flex the haunches in, and the inside leg aiding to flex the ribcage out. The outside rein is released forwards to permit the flexion of the neck onto the bend, and the inside rein gently positions the horse's head inwards, into alignment, while receiving the softening of the jaw created by the channeled energy flowing through from the inside hindleg. In false bending, the energy generated by the inside hindleg (greater than that of the outside hindleg due to its increased leverage) is sent towards the outside shoulder via the natural rotation of the horse's ribcage to the outside when the inside hindleg pushes off. This flow of energy, being misaligned with the direction of the horse's body, creates a continual unbalanced force, which the rider is compelled to contain with a holding outside rein. This, in addition to blocking the flow of forward movement, prevents the horse's neck from flexing onto the alignment of the bend, and the jaw is unable to release and soften onto the contact. The rider feels this resistance in the inside rein, and often attempts to relieve it by 'fiddling' or 'playing' with the inside rein. The real problem, however, is that the inside hindleg is not carrying under to support the flexion of the inside of the horse's body, and enable the release into the inside contact. Without a postural pillar around which to form the bend, the rider's seat is pushed outward by the horse's ribcage, and ends up off-centre on the horse's spine. No amount of 'inside leg into outside rein' can remedy this structurally unsound postural dynamic, because the horse is receiving no support for a correct aligned bend, which is in itself contrary to the horse's natural way of balancing while turning. 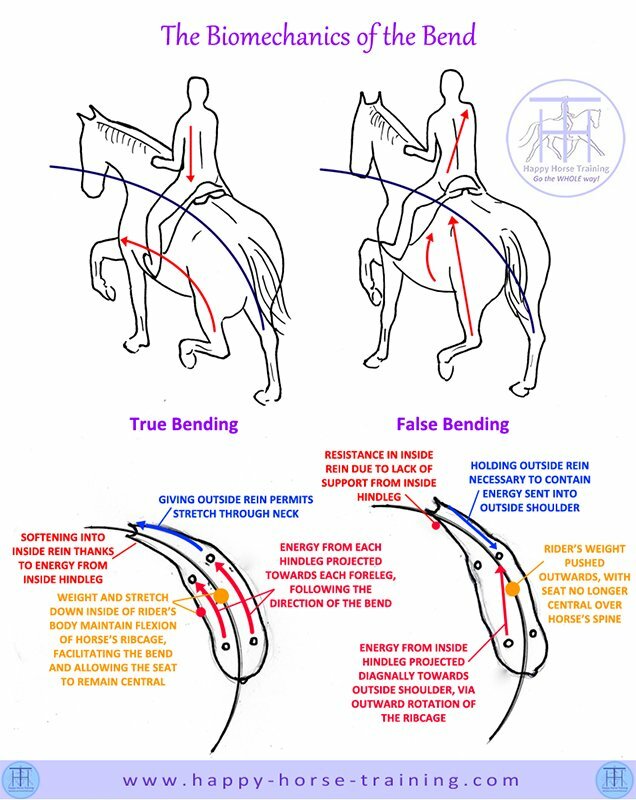 True bending is the key to the longitudinal stretch, which lifts the horse's spine into a healthy and strong posture for carrying a rider. This is because true bending harnesses the energy from the hindegs, and channels it through the horse's body, in the same way as an archer flexes a bow. It is much harder to align the horse's body in work on a straight line, but by strengthening the longitudinal stretch through correct bending on both reins, the horse's body will be drawn towards evenness, and maintaining alignment in straight-line work will become possible.